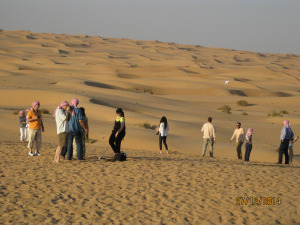 Ten Land Rovers drove into the desert each carrying between six and eight passengers in Arabic headgear. 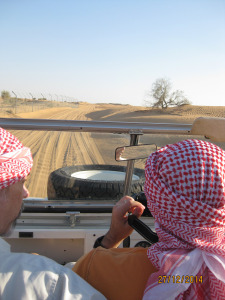 The drivers took different routes up, down, round and through the sand dunes. We saw no more than the occasional vehicle, giving the impression that the desert belonged to us. 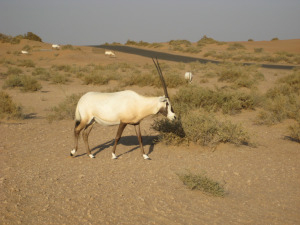 Arabian Oryx lifted their heads as we passed, unperturbed by the dust cloud flowing out behind. 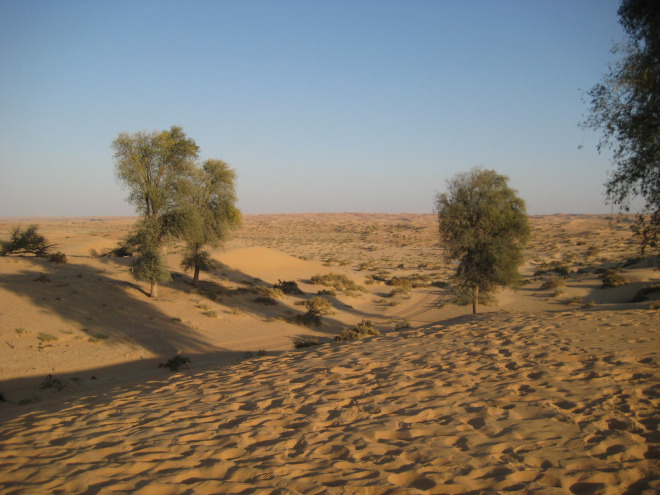 Reaching a rendezvous point, we left the vehicles to clamber up the steep sides of sand dunes, the better to gaze across the desert as shadows lengthened and the sun settled lower towards the horizon. Desert shrubs and trees indicated the presence of water beneath the surface and later, on our way to dinner, the driver stopped to show us various examples of native vegetation.